Presently the low-FODMAP diet (fermentable oligo-di and monosaccharides and polyols) is regarded being the most helpful diet for patients with irritable bowel syndrome (IBS), inflammatory bowel disease (IBD) and other digestive disorders. Reducing FODMAP intake by consuming low-FODMAP foods and avoiding high-FODMAP foods may help to control or eliminate symptoms associated with these digestive diseases and may lead to a more comfortable belly. The countless number of books on the low-FODMAP diet serves as an indirect measure of the successfulness of the diet. For a varied and balanced low-FODMAP diet it is helpful to have information on the FODMAP rating for more than 50 foods. The FODMAP Navigator offers charts with FODMAP ratings for more than 500 foods, food additives and prebiotics. 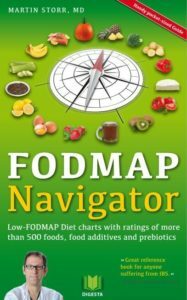 This FODMAP Navigator is an excellent chart book for everybody intending to go on or already conducting a low-FODMAP diet.